Amidst the tragedy that led to the untimely death of a promising young actor, AJ Perez will remain within our hearts. Two lucky people had been chosen to receive AJ Perez's corneas. Lawrence Villanueva, 28 year old and 8 year old Daniel delos Santos will live AJ's legacy. Lawrence's eyesight started to deteriorate three years on his left eye. Was he overwhelmed with joy of the great news. "God really works in differenct ways talaga," Lawrence said. "Kahit na anong donor yan, kidney or heart, it's their legacy eh. It's part of them also," he added. Lawrence, personally claimed AJ's left cornea, had his operation last Maundy Thursday and was a success. On the other hand, Sarah delos Santos, Daniel's mother kept praying for her sons donor. They feared her child might go blink as time passes due to cornea ulcer in his right eye. Their prayers were answered through AJ. 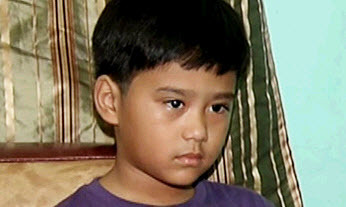 Daniel said, "Salamat po sa nanay ni AJ dahil po sa cornea makakakita na din po ako." The operation will take place today. 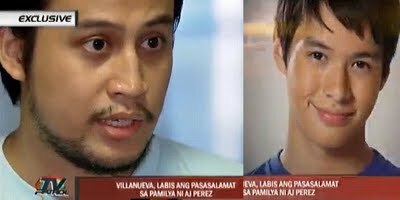 AJ Perez will remain with us and his legacy will continue on.